A Latin Mass Catholic Missal makes it easier to follow the Mass prayers. Which traditional Catholic Missal is the best Latin Mass Missal? These four all generally have used the Douay-Rheims Bible wherever they quote the Bible. Check yours. A good one will use the Douay-Rheims Bible whether it is a Sunday Missal or a Daily Missal. Think about it. What sense does it make to use an old Missal with new Bible quotes? Being the first Biblical "thought for the day" book, the Missal has scripture readings for every day through the year. It may well be the dearest book you will ever own. Mine is. It is the most used book at our house for sure. Traditional Missals - Children, New Marian, Lasance, Angelus, Baronius. How to tell - Selecting a Daily Missal. Which one is best? Which Missal To Use? 1962 or Earlier? It depends on which Mass you attend. (I know. That's an awful statement about "the" Mass). The New Marian Missal has the most versions in print. Both the Baronius Press version and the Angelus Press versions of the 1962 Catholic Missal are based on the New Marian and use the Douay Bible for the Sunday and Daily Propers. You will be able to follow along quite well at Fraternal Society of Saint Pius X (FSSPX), Fraternal Society of Saint Peter (FSSP), and other traditional Latin Masses with these books. There are some SSPX and FSSP priests that use the earlier Missals. Pope Francis has given some congregations explicit permission to use old Missals. Also, some orders like the traditional Benedictines have been able to keep their Missal from before 1962. What's the main difference between Missals? The main difference with the older Missals is that, as early as 1948, Bugnini was busy removing many readings from the Proper of the Day and many ceremonies from the newer and newer Missals. 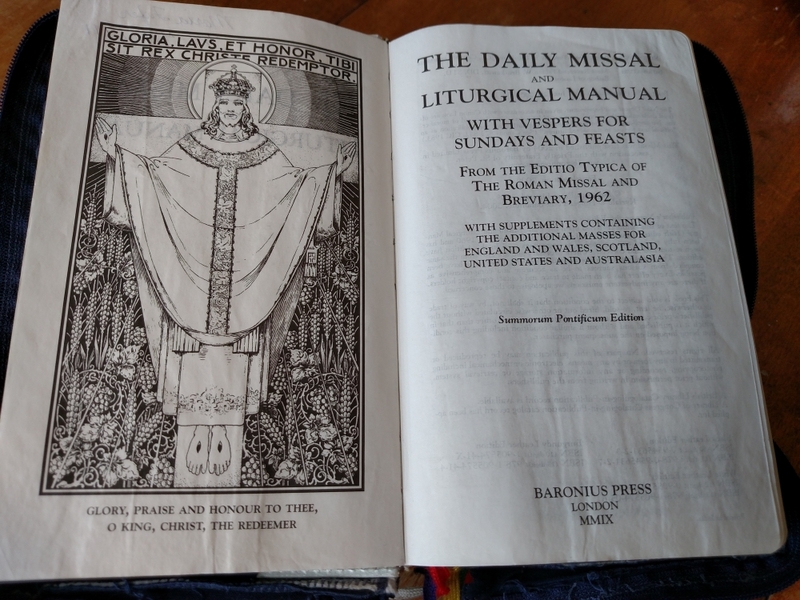 If you own an older Missal, you'll have the right prayers; but you'll have to hop through some - especially during Holy Week. In effect, the 1962 is not much different from the 1956 or 1958 versions. 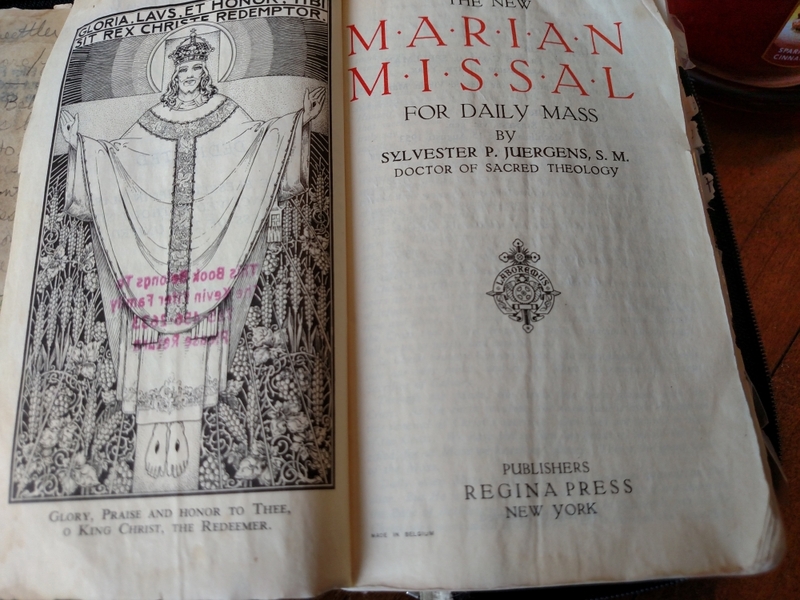 For twenty years an old Missal (1953?) was all that I had had. It had been a gift from my parents, thank God; so I simply learned to navigate through the extra prayers when a priest was using a newer Missal. If I was at a sung Mass I also had time to read the extra prayers, which is wonderful! Otherwise it's fairly simple to skip to wherever the priest is reading if you pay attention to the first words of the Latin prayer or look for proper nouns with their revealing capital letters. The old New Marian, Lasance, and St. Andrew Missals were wonderful, and the reprints have near zero changes from the versions reprinted from the 1940s and 1950s. The pictures are lovely and instructive. The Lasance is particularly excellent for boys who want to be altar boys because the pictures in the Ordinary of the Mass show the main action of the server at the right moment. Still wondering which Missal to use? Ask your priest which Missal he uses or recommends so that you can make your decision better. If you go to different Masses due to travel, etc., you might want an older Missal so you would have all of the prayers. In this case you would not have some of the 1962 (or 1970?!) feast days - I'm not sure which ones these would have been but I think that there are a few like Mother Cabrini's feast day which before 1970 was on the date she died or entered Heaven, December 22. The 1970 calendar moved the date to November 13. I have no idea why. Nor do I know why a "1962" book would have 1970 dates. 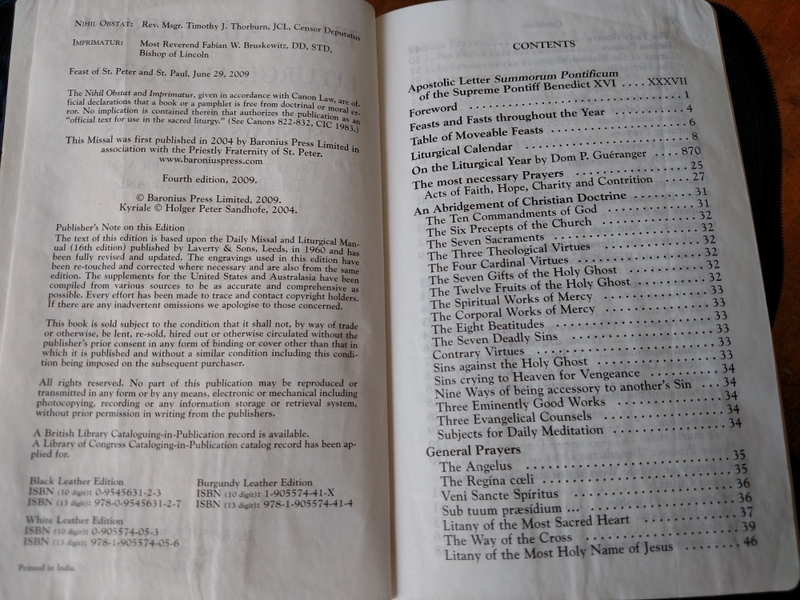 The "1962" Missals with the Douay scriptures are the Baronius and the Angelus versions. I share comparisons between these Missals below. 1. Uses the 1958 calendar, virtually the same as the 1962 Catholic Missal. 2. Uses the 1945 calendar with some noted additions. Wonderful pictures. 3. Uses some 1970 dates (Cabrini), maintains priest and sacrifice in rubrics. 4. Uses the 1962 dates, changed priest to celebrant and sacrifice to celebrate. You'll want to find a Catholic Missal that has a good translation of the Ordinary which is the part often found in the center of a Catholic Missal that is said for every Mass. "Judge me, O God, and distinguish my cause from a nation that is not holy". If the text reads otherwise, try to source whence it came. Hint: It's likely to be a 1940s Confraternity of Christian Doctrine (CCD) or New American Bible (NAB) translation. Why does the translation matter? The Catholic Mass encompasses all the basic Catholic beliefs. "Lex orandi, Lex credendi." We believe what we pray, so it is important to buy a Missal that teaches what we believe. The Bible is a huge source of what we believe. Beware versions that use unisex language and paraphrases. There are so many old Missals that it is super hard to compare them all. Even in different editions of the same version there are many un-documented changes. The best place to start is to determine which Bible was used and if the Ordinary prayers are good. First, let's talk about finding a child's Catholic Missal. There are many and they often have a child's version of the Ordinary. 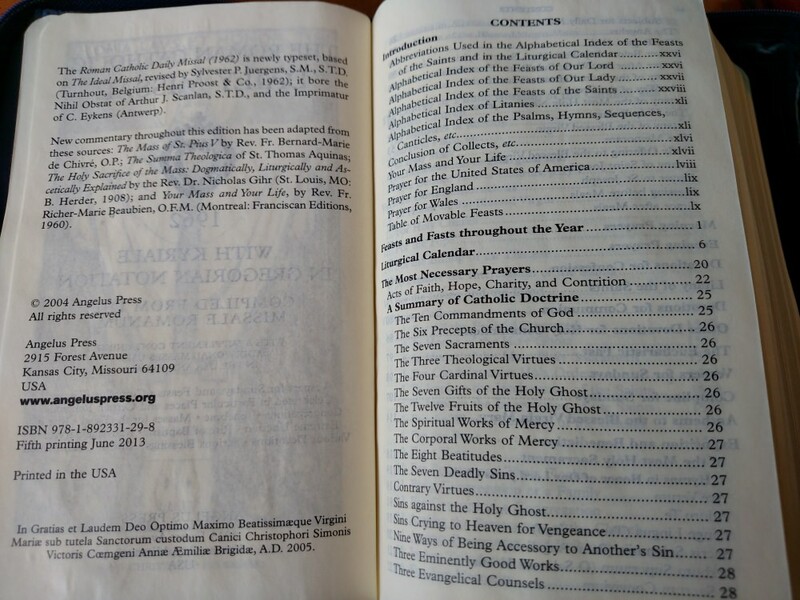 What I like about My Mass Book as published by Neumann Press is that the one published in the 1990s had the exact same English prayers as the adult's Missal. It also has excellent pictures that show where the priest is on the altar. You'll love this book as it skips the fluff through the book. I hope that the current editions remain the same. My Mass Book is an excellent book for boys hoping to become altar servers because they can see what the priest and altar boys are doing in the pictures. During Mass the children often cannot see over the adults to see what is happening. These pictures help them see and follow the Mass. You'll like giving the children a smaller book till the time when they can handle a larger "real" Missal and they are ready to read the text better. One drawback is that My Mass Book can be a bit long lengthwise when shorter children are kneeling as it hits the pew in front of them; yet the better text is worth it for our family. 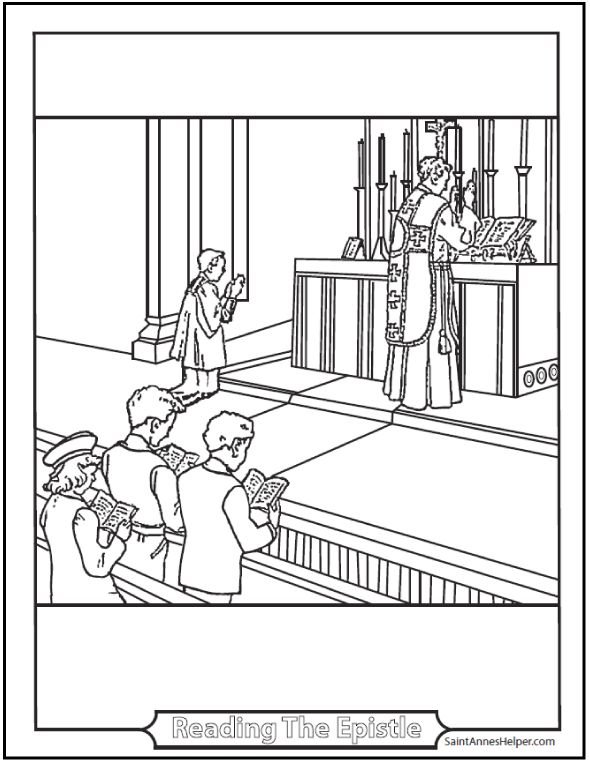 Also, the pictures are fairly well spaced for matching the speed at which a priest goes through a Low Mass. TAN Books now sells My Mass Book by Neumann Press at Amazon. My first experience using a Missal was with a New Marian Daily Missal. 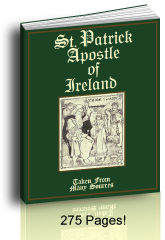 It remains my favorite, because it uses the Douay translation, has beautiful prayers, and is easy to read - especially for sung Masses or dialog Masses. The Gloria and Credo are much easier to answer in the New Marian and Baronius. When I first read "Judge me, O God, and distinguish my cause from the nation that is not holy: deliver me from the unjust and deceitful man." I was in love with the Mass. My heart rejoiced, "This is beautiful!" There are many reprints and publications of The New Marian Missal, so shop around and keep the observations from this page in mind. I find that the New Marian Missal has as good or better a layout than the Lasance, is much easier to hold, and does not have some of the changes that the Angelus Press version has. 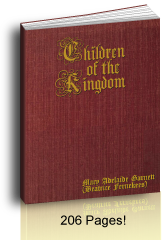 Catholic Free Shipping and Loreto Publications have been alternative sources for the New Marian, too. I have used all of the above and treasure the New Marian Missal. The oldest one we own is an early 1950s version. 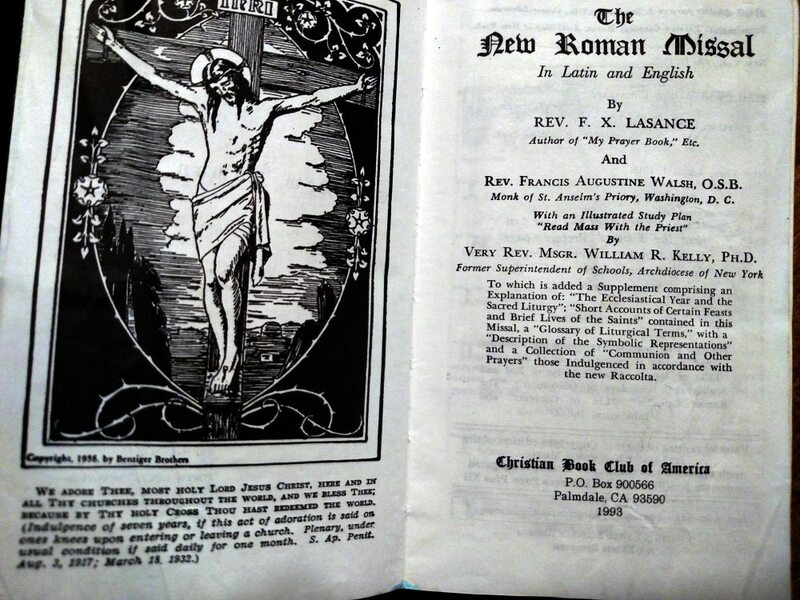 I would love to have the original 1947 New Marian Missal from before Bugninin's 1948 changes. I hope these notes help. The Douay-Rheims version of both the Epistles and Gospels, etc. Complete Propers so you do not have to flip back and forth in the book. Stories of the saints in the back organized by calendar date. The complete Angel of God prayer. Lovely versions of the prayers. Clear pictures of the priest's movements at Mass. Great for altar boys. Beautiful woodcut pictures for the main holy days and feast days. A major consideration, though, is how heavy the book is. It is also so large that it can be hard for small children and oldsters to handle. For those of us in between, it is an excellent choice. You can buy the Lasance Missal at Amazon. A reader was kind to write to let me know that Amazon was out of Lasance Missals. I was glad she wrote. 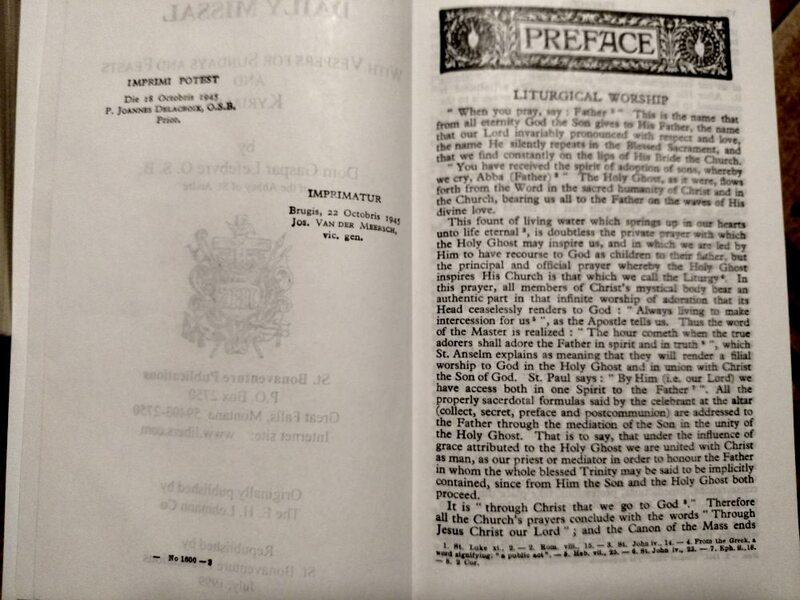 A very popular blogger (Dr. Taylor Marshall) promoted it recently which is possibly why there's been a rush of people buying the Lasance Missal. I've spent quite a bit of time searching the internet and am finding that it is sold out in over five regular places outside Amazon and Ebay (OLVS, St. Bonaventure, El Camino Real, and others). I am seeing that the publisher expects to publish it again soon, so I think you'll be able to get the Lasance soon. The New Roman Missal by Fr. Lasance is now out of stock and is being reprinted by the publisher. They expect to have it completed in early February. Fraternity Publications will be helping this small, family-run publisher to purchase a large quantity up front. We encourage you to purchase now even though you won’t receive the item until it arrives from the printer. Thank you and God bless! The Baronius Press Catholic Missal uses a similar text as above. 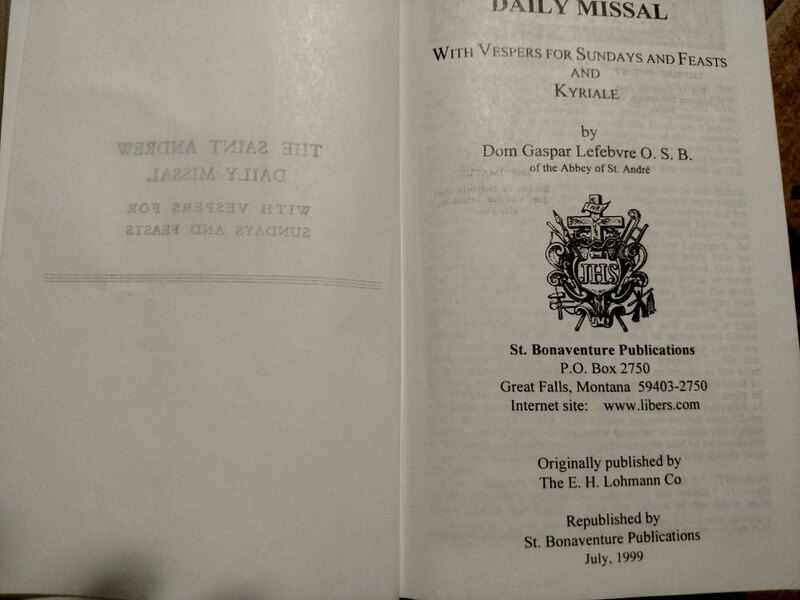 It is what used to be the New Marian Missal by Sylvester Juergens, S. M. Baronius also added the Kyriale in the back as the congregation had not join in singing the Liturgical hymns until the days of the Dialog Mass in the 1940s. Instructional notes before the readings. Wood cut pictures for the main feast days. Notes from the Imitation of Christ at the end of most Propers. Some of the dates are from the 1970 calendar (Cabrini November 13). Added the Luminous Mysteries of the Rosary and the Divine Mercy devotion. One thing you'll really like is the soft thin ribbons as they are not so likely to cut your pages as quickly as the thicker ribbons. You can buy the Baronius Missal at Amazon. What's nice for gifts is that Baronius offers both black and white Missals. 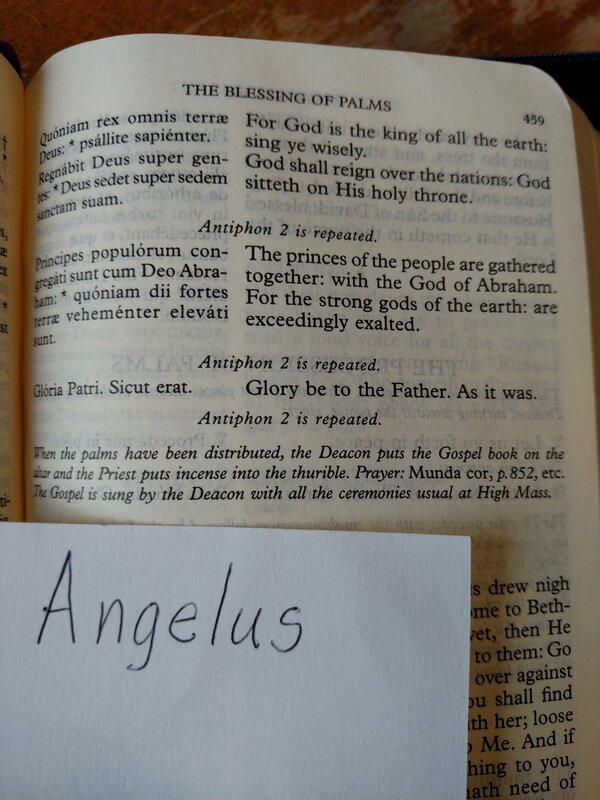 1962 Missal Roman Catholic Daily Missal with Kyriale in Gregorian Notation, Angelus Press. 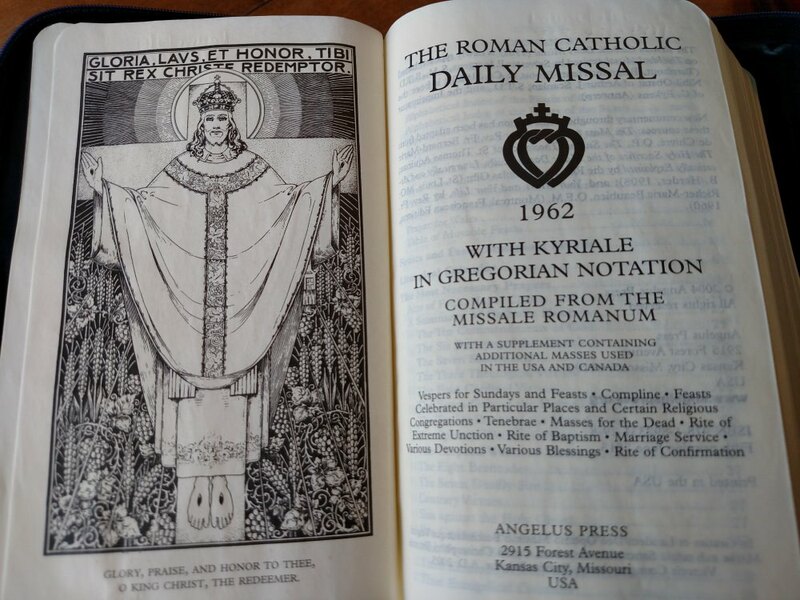 1962 Missal - The Roman Catholic Daily Missal with Kyriale in Gregorian Notation, Angelus Press, Imprimatur. Angelus Press' Catholic Missal also uses what used to be in the 1940s and 50s The New Marian Missal by Sylvester Juergens, S. M. The Angelus added the Kyriale in the back and is very similar to the Baronius (above). Beautiful wood cut style pictures for the main feast days. Some of the dates are from the 1970 calendar, yet added in a separate section behind the Propers of the Saints. In comparison, I think that the current publication has a nice binding that makes it easy to handle at Mass. I would prefer that they put the English translation on the outside because it harder to read down in the spline of the book. Perhaps it is designed for priests and religious who may appreciate the Latin being easier to read. The Angelus version removed the term "sacrifice" and replace it with the term "celebrate" or "celebration". "Priest" was replaced by "celebrant". In the concluding doxology "by Him" is changed to "through Him". "Accept" is changed to "Receive" at the offering. Anyway, these are just some things to consider when you're buying the Angelus 1962 Catholic Missal at Amazon. You'll want to protect your investment in your Catholic Missal. 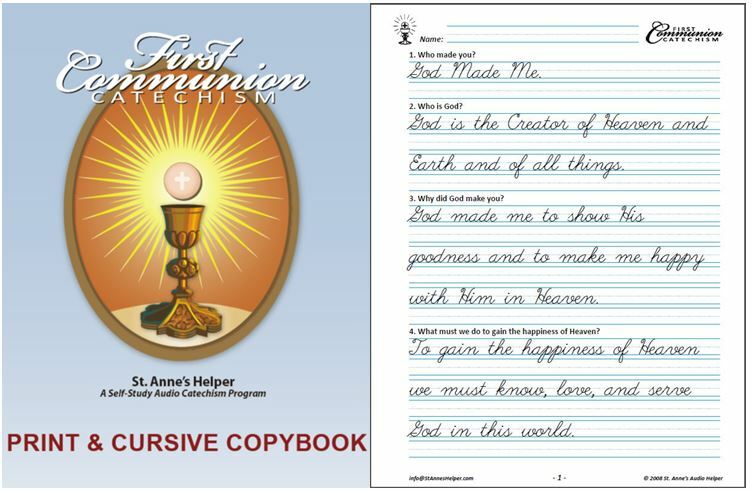 The Sisters who taught our children recommended that we put Missal covers on the children's Missals and we are so glad we followed their advice. Covers help protect from water damage and breaking. Hint: Be sure to give the ladies the exact measurements of your particular Missal as the companies change sizes through the years and different publications' Missals are sized differently. 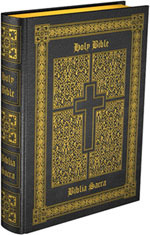 Zippered Bible and Missal covers - Custom designed for your Bible, Liber, Missal, child's Missal, or any other book you treasure. Genuine leather Missal covers - Shipped from England. 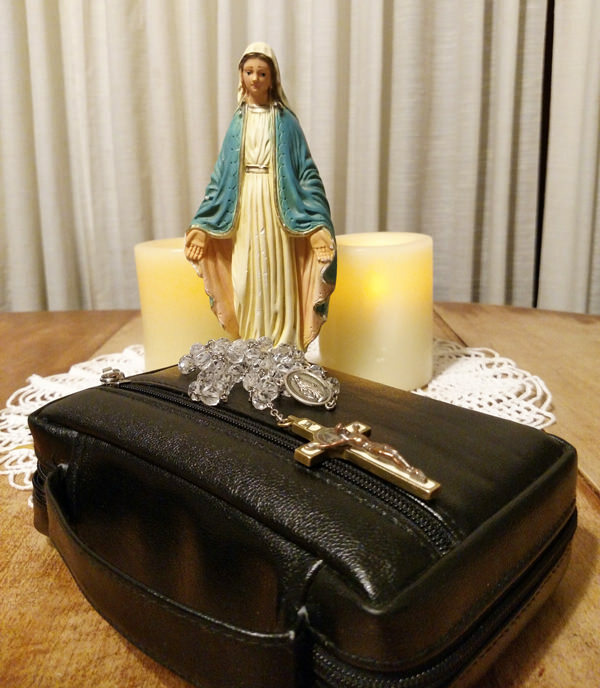 You'll receive the VAT tax discount and can buy lovely rosary cases and ribbon markers. I love their best selling leather pocket oratories! 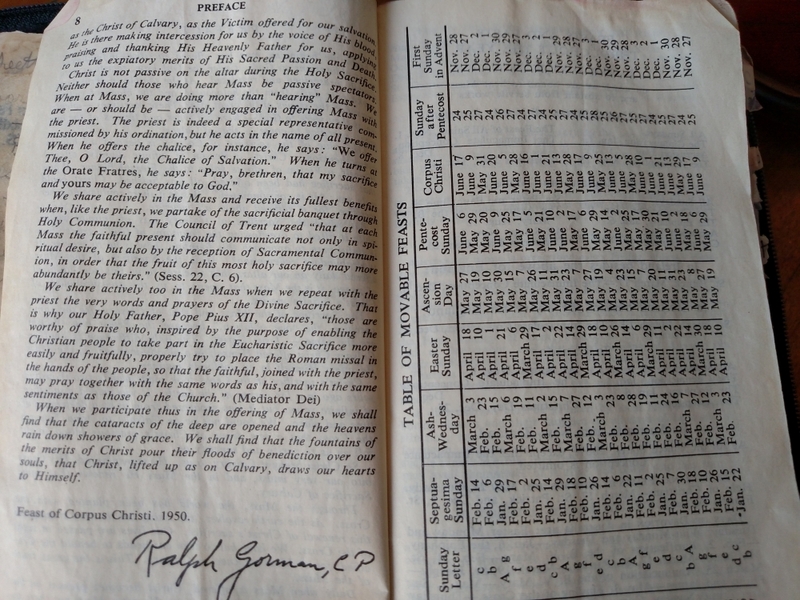 If you find these old Catholic Missals online, or at bookstores, thrift shops, and yard sales; you'll be glad to know that they have the Douay Bible references, too. They're full of wonderful pictures, timely quotes, and descriptions of the Mass ceremonies. These are getting harder to find every day, but you might be able to find them at a more discounted price than before the publishers began publishing Missals. 1945 Saint Andrew Daily Missal by St. Bonaventure Publications - title page. Saint Andrew Missal, St. Bonaventure Publications, imprimatur page. The Saint Andrew Daily Missal from 1945 by Dom Gaspar Lefebvre, OSB, was a staple amongst traditional Catholics for many years until publishers began re-typesetting Missals in the 1990s. "Please note, when we reprint a book, the content of the book is unchanged, it is printed exactly as it was when originally printed. The only change we make is the first page, which contains our publishing information." The other version uses the paraphrased Confraternity for Christian Doctrine version of the Bible (CCD). Stories of the saints and feasts. Beautiful pictures for the larger feasts. Some of the dates are from the 1970 calendar. It has five colored bookmark ribbons and guilt edges. You might prefer the newer Missals as there is a lot of page turning between Propers as not all of the Epistles and Gospels are spelled out for each day. This is very confusing for younger children and can be noisy in church. Not to mention that some of the feasts are different. This is actually still in publication St. Bonaventure Publications at Libers.com. Here's an oldie but goodie: The New Marian Missal For Daily Mass was first published in 1947 and bears a 1953 Imprimatur by Frances Cardinal Spellman. You might want to peruse the interior pages before you buy a Missal, so I have included pictures below. 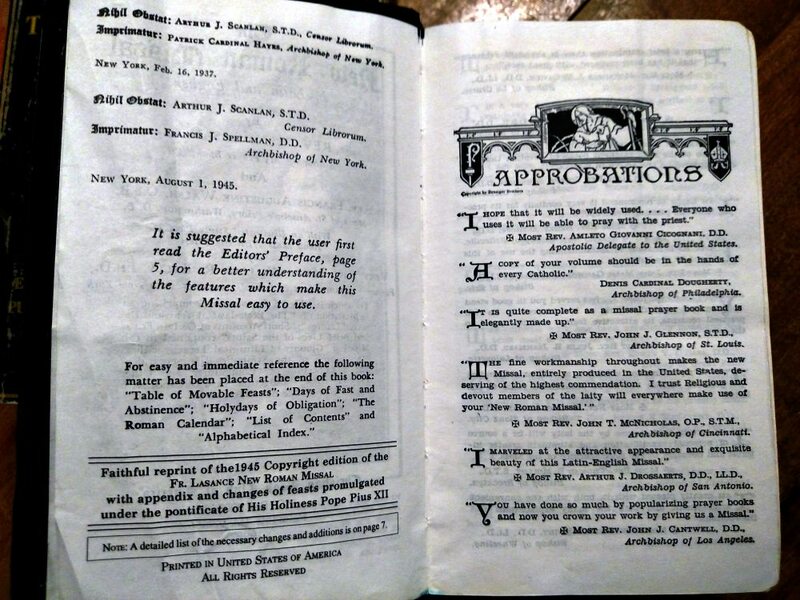 The first one is a photo of an actual old Catholic Missal (1953). You can click on the small Missal images to go to a gallery of large photos. 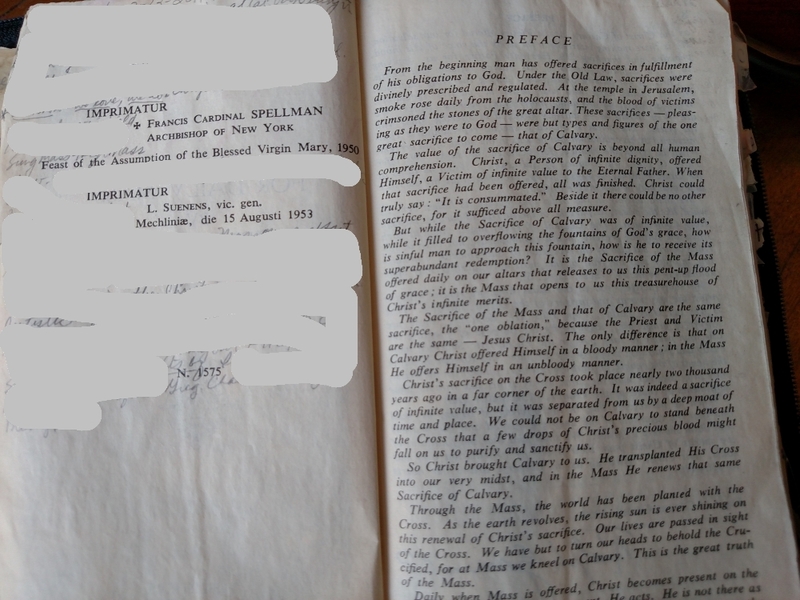 1947 The New Marian Missal For Daily Mass, Preface and Calendar of Feasts. Most of the Missals on this page have the same features. A Missal for children or a Sunday Missal will not have the daily propers. Or whether two saints share the same feast day. Each day has its Proper making the Missal the original daily meditation book. Latin Mass Missals help you follow the Mass and they sometimes explain the Liturgy. They usually have the main Catholic prayers. You can also learn about the holy days and the feast days. Some even include short Lives of the Saints. What's wonderful is that you can use these Missals year after year as the traditional Liturgical Calendar does not change much. Certainly no figuring whether you're on Year A, B, or C.
A Missal is also an excellent Confirmation gift for those children who are old enough to have the responsibility of using such an important book, and for those who are entering the Church as adults. If you're comparing Missals, you can find the widest selection at Amazon including the 1945 Fr. Lasance New Roman Catholic Missal, The New Marian Daily Missal, the 1962 Baronius and Angelus Missals. Each of them is a Daily Missal and has the info you would want in a Sunday Missal because it is a subset of the daily. 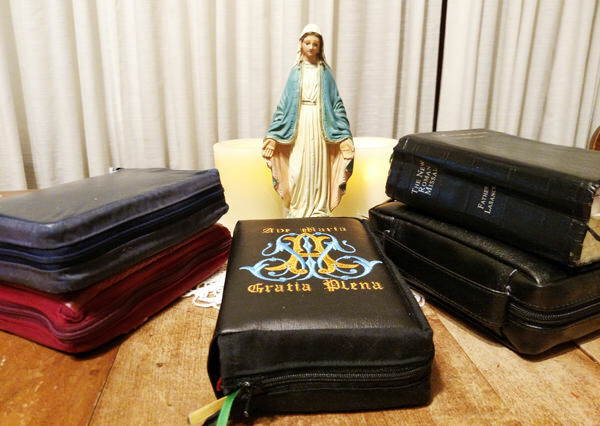 Finding the best Catholic Missal, a Daily Missal, Sunday Missal, or 1962 Missal, can be a real trick since most publishers don't sell a variety of missals. They find a version they like, usually the best that they could find, and they print a reproduction of it. Then they want to recoup their money. Are you choosy? Does the Missal use the Douay-Rheims translation for the scripture readings? How does it "translate" Bible quotes like the Psalm 'Judica me' at the beginning of the Ordinary of the Mass? Also, how does it word prayers such as "Adoro te devote" by St. Thomas Aquinas on the feast of Corpus Christi? Another big "red flag waving" is the artwork. Is it respectful? Or magic-marker art? The Vulgate by St. Jerome is still the only "official" Catholic Bible. The Douay-Rheims version is the closest version in English and it's been in use for centuries now and was the only "version" till the 1930s and 40s. There are many places where paraphrased Bible versions like the Confraternity version (Confraternity for Christian Doctrine, CCD) contradict or diminish the words' meanings in the readings from the Douay. Comparing Bible verses is a helpful test in finding a good Missal (or Lectionary for that matter). During Advent St. John the Baptist insists that we do penance. Protestant and other versions use "Repent". The Douay-Rheims Bible uses the word "man" in the classic manner meaning the universal "mankind" (which includes all those with an intellect or will: young or old, male or female, propertied or not, etc.). Many paraphrased versions use unisex words. The CCD was a leader in this in the 1940s. adore instead of worship where one can hear the Latin sounds like adore when Father reads it from the altar, etc. This applies to many more words that are changed in other versions. The easiest Bible verse to find is the first prayer of the Mass. Check it to compare. Does the Judica Me ask "Judge me, O God, and distinguish my cause..."
Or does it command "Do me justice..." (or worse)? If one can prove there is no change in meaning in the second, one cannot prove that the demeanor of it is more humble. The better translation retains the Catholic disposition in a petition and offers a better reading experience through the year. Keep these thoughts in mind as you search the Missal prayers and weigh which has the better version. Another Missal prayer to check is the The Prayer before a Crucifix. The Fr. Lasance Catholic Missal uses the better word contrition instead of repentance as found in some Missals. The Adoro Te Devote by St. Thomas Aquinas as found on the Feast of Corpus Christi is another good place to look. Some versions use more sensual words in the prayers. If the words of the prayers betray the sense of the Faith, beware the book. 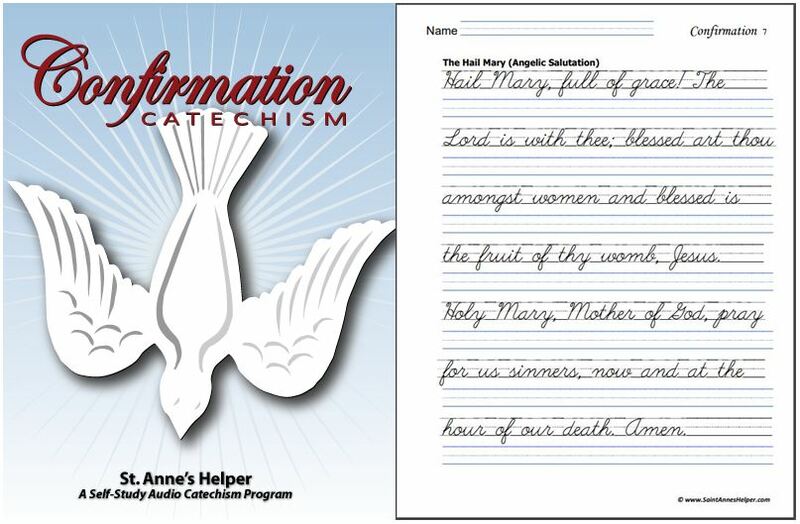 This is one reason it is so important to learn the best Catholic answers to the catechism. We need to have a way to tell the good books from the bad and the catechism is the best place to start. The catechism teaches the Apostle's Creed, the Sacraments, the Catholic Ten Commandments and the virtues. If the sense of a text concurs with these then you can have more certitude that the Missal teaches the Faith and prayers well. A Catholic Missal uses beautiful art. Many times a book that is published by a well financed institutional publisher uses poor artwork. Be on your guard. This is a red flag waving. Haggard or ugly faces, magic-marker art, or indecent and unusual presentations that distort the Catholic message in the picture, usually indicate a lack of discernment on the publisher's part, or a deliberate misstatement about the Faith on someone's part. I don't mean those publishers who are struggling to revive the Faith who in good faith did not know that there is a wealth of Catholic art now in the public domain. It is well known that there are publishers who have purposely published bad books, and often times bad artwork is a red flag waving. A new trick since the turn of this century is to restore some Catholic elements while removing others. 4. What Makes A Catholic Missal Trustworthy? The prayers retain a sense of humble sacrifice to the Blessed Trinity. Beautiful prayers that are well worded. And beautiful artwork. This is easy to scan for a general impression. This is the most important things to consider. Truth first. Do the words themselves reflect the Word of God, or are they paraphrases? Translations of prayers in a good Catholic Missal do have some room for legitimate variety, especially if the translator comes from a different country, for example: England, France, Germany or Spain. You'll probably agree that there is no room for purposefully different "versions". See my list of red-flag catechism sightings to see how "minor" revisions and omissions are not required by law to be marked or to have the copyright and publication information changed. In this day of easy electronic manipulation one needs to be able to compare against the standard of Catholic principles: truth, beauty, modesty (in words as well as in images). Here's an interesting overview of Dr. Marshall's reason for preferring a Fr. Lasance Missal to the Angelus. He acknowledges that the Lasance is not updated, but shows that it's not too hard to stay with the priest on most days. Enjoy! Latin Mass Hand Missal Review: Which is the BEST? Keep true Catholic principles in mind when you're searching for a Catholic Missal. You'll find that the basic Catholic beliefs are easiest to find in the Baltimore Catechism and the easiest way to learn them are in such books as the old Baltimore Catechism No. 2, the Catechism Explained (which is an adult Baltimore Catechism), or the Catechism of the Council of Trent. Personalized Bible and Missal Covers. Thank you for visiting Saint Anne's Helper! It's easier to follow the Mass with a Catholic Missal.